Art Brut between Sweden and Japan is in the context of 150th anniversary of diplomatic relations between our countries. This art exhibition is performed in Edsvik Konsthall in Sollentuna, from 3rd of June to 6th of July 2018. The art works are from both Japan and from two places in Sweden from painters with intellectual disabilities. The first one is Ateljé Inuti, that acts with people who have intellectual disability or autism spectrum disorder to create artwork. They operate the activity centers which base on LSS, the law for assistance and services for people with certain functional disorder. There are four activity places in the heart of Stockholm and the participant can create art at home with the guidance of the art in the creative and free atmosphere. The other source for art works in Sweden is Mentalvårdsmuseet, the museum of art on psychiatric medicine located on Dalarna, in the middle of Sweden. Most of the work made in the hospitals were mainly utility articles and moreover, free creations or creative activities by the patients who were not always encouraged. 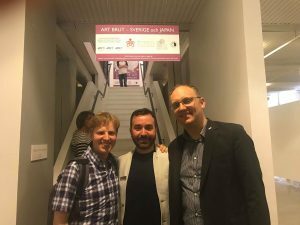 On 24th of April, 7 delegates from the Art Brut Project were invited to be official partners in the International Exchange Project for Disabled People’s Culture and Arts. During the panel debate between JCI Japan and JCI Stockholm was opened a situation of disabled persons, projects in both countires, cultural topics, future coopetation between JCI Japan and JCI Stockholm and how we could connect people to become active citizens for a better World, in order to be known to all audience as a leading global network of young active citizens. This event was very important to strengthen relations between two JCI National Organizations. Art Brut Forum ”Dialogue on Society, Culture and Innovation” was hosted by Yoshiki Watanabe, ex-Ambassador of Japan to Sweden and Yoshitaka Kasahara, President of Shiga Prefectural Medical Association. During the forum we saw many of the art works being present at the exhibition. 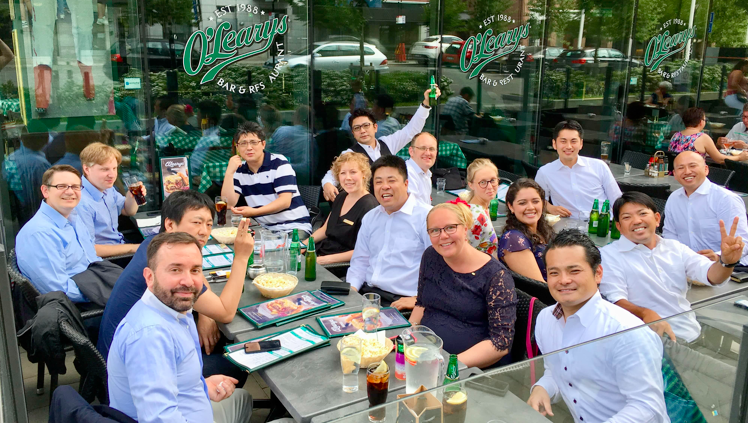 Afterwards we continued discussions and networking with JCI Japan members at O’Learys. During 2018 Sweden and Japan celebrates 150 years of diplomatic relations. This anniversary year means a range of activities in both Sweden and Japan. The Art Brut exhibition at Edsvik Konsthall in Sollentuna is open from 3rd of June to 6th of July 2018. It is really recommended to all JCI Stockholm members, guest members, Senators and alumni to visit the exhibition and mention that you belong to JCI while entering the art hall. See the JCI logos set up as partners of the project.